Game aficionados will gather May 26 and 27 at the Royal City Curling Club to raise money for diabetes research. Tickets are available at Boardgame Warriors – 708 Clarkson Street (604-540-6322). Costs are $20 for Saturday, $15 for Sunday, $30 for the whole weekend, or $50 for a weekend pass for a family or couple. Boardgame geeks are a special group of people. They’re incredibly diverse but they all share a passion for sitting around a table and trying out the latest releases a group member has brought back from a gaming expo. Their love of a good mental challenge makes them disdain light, popular American games like Monopoly, but they’re endlessly patient with new players and kids. 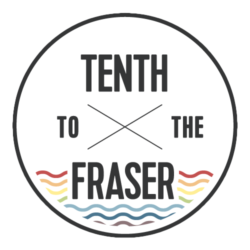 And once a year they get together in New Westminster to game, socialize, and raise money for Team Diabetes members who are fundraising for either a full or half marathon. Michael Blais and his wife Waleah Cook started organizing Boardgaming for Diabetes in 2006. This year it’s the May 26-27 weekend at the Royal City Curling Club. I’ve attended for the past two years and always had a great time. People bring their kids (12 and under are free) and the curling club bar upstairs is open. The more hard-core gamers often stay all weekend, but more casual gamers like me can choose to come for just a day. Part of what makes it great is that you’ll almost always be able to find a group who wants to try something you want to play. 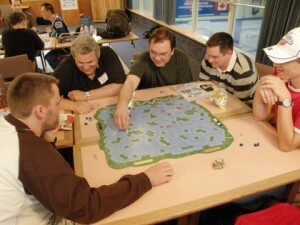 The games range from party games like Wits and Wagers and Telestrations to hours-long strategic war games. Last year I got the chance to play Dungeon Lords, a really cute game where you play a dungeon master using your minions and recruiting monsters to fight the heroes who are trying to conquer you. I also got to try a shipping-themed game called Before the Wind, and an hilarious kids game called Loopin’ Louie, which involves hitting a lever to prevent a clumsy plane from accidentally knocking over your chickens (you kind of had to be there). Sadly I’m away for a conference this year, but I really recommend other folks stop by for a game or two on the May 26-27 weekend. There’s really something for everyone and all the money raised goes to a great cause. There’s also a 50/50 draw, silent game auction, and great door prizes. In New West, tickets are available at Boardgame Warriors – 708 Clarkson Street (604-540-6322). Costs are $20 for Saturday, $15 for Sunday, $30 for the whole weekend, or $50 for a weekend pass for a family or couple. There are other ticket locations around the Lower Mainland and you can get more information at https://www.facebook.com/DiabetesGaming.